Going in a slightly different direction than a previous post on “The downside to being in IT”, I saw a post by Michael Hyatt (Blog|Twitter) recently that had an infographic about why sitting down so much is killing us. The biggest part about the graph for me was sitting at a reclined angle was actually less strain on your back than sitting upright. I guess you could argue that sitting that far back is going to put more strain on your eyes, neck, and other important body parts so maybe it’s a wash. I’d love to hear your thoughts on what you do to help your body handle all this “desk stress” that we put on it in the office. I can’t think of many products that incorporate a period in the name of their product, but Doit.im isn’t like any other product I’ve seen. I believe that I’ve finally found a tool that works for me on all levels of GTD (Getting Things Done). There are multiple clients so that regardless of where you are capturing data you should be covered. I stumbled across this software in the form of an Adobe Air application while looking for something else for project management. Turns out, this product met a bigger need than what I had been looking for. It offers clients for the iPhone, iPad, and Android so you’ll have your mobile device covered if you are using a non-Microsoft format. There’s also a download for Windows, but I tend to prefer the web client. The web interface offers an old version and a beta version, and I tend to gravitate towards the old version a bit more. The best part of all of this is that the software is free. I’m not sure how long it will stay that way since it’s a pretty slick tool in my mind and way better than some of the other implementations of GTD that cost money. It’s all in the cloud as well, so your data is accessible from multiple places. They are located in China, so you might want to check out the privacy and terms so that you feel comfortable. I would advise to always be careful what info you put out there with new software. Drop by their site and give it a go, and I’m sure you won’t be disappointed. You can read more about them on their website. Check out the API and see what you can do with it. How many times have you found yourself slouching or basically stuck to your office chair. 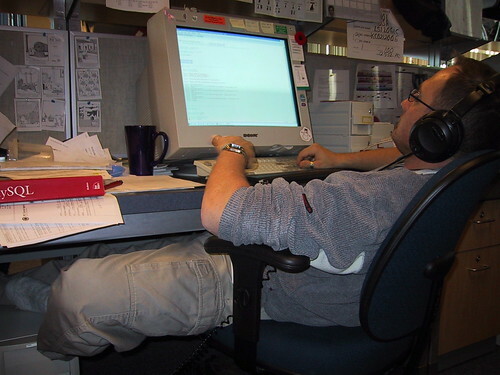 If you are anything like me, you spend an average of 10-12 hours a day in a desk chair while in front of a computer. I was amazed when I first saw this planning worksheet that would help you determine the proper position for your desk, monitors, keyboard and even chair. The first time I measured I was so far off that I figured there was no wonder my back was hurting. You can go to the Ergotron website and fill out the form to print a copy or you could just print some blank ones out to hang up on the corkboard at your office. I hung up one copy last week, and someone made copies and pinned them beside it. Hope this helps you not feel so sore from sitting in a chair all day, and maybe it’ll convince you to get up out of your chair more.